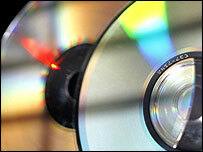 The ringleaders of a gang which made more than £1m from producing counterfeit CDs, DVDs and computer games have been jailed. Teesside Crown Court heard how the group of 10 family and friends raked in £11,000 a week during the scam. The two main ringleaders were jailed for three-and-a-half years. Mark Bailey from Tyneside and Paul Canning from Wearside admitted conspiring to defraud the music and film industries. Three others were jailed for up to 12 months. Five others received non-custodial sentences. The court heard how the gang set up copying factories in houses and a caravan. They were eventually tracked down by private investigators, together with officers from Durham and Northumbria police forces. They sold the pirate copies on market stalls and at car boot sales in Sedgefield, Seaham and Spennymoor. The gang also produced counterfeit packaging, selling music CDs for £3 and films for £5. Bailey, 26, from Gateshead and Paul Canning, 32, from Houghton-le-Spring, pleaded guilty to four charges of conspiracy to defraud the music and film industry. Gillian Harrison, 26, also from Gateshead, pleaded guilty to conspiracy to defraud and was jailed for six months. Her brother Glen Harrison, 31, was jailed for 12 months for distributing infringed copies. David Middleton, 39, from Wallingham, Gateshead, was jailed for four months after admitting a similar offence. Three women were given community punishment for distribution and conspiracy to defraud, and a married couple were each fined £500 for distributing pirate material. After the hearing, a spokesman for the BPI said: "Music piracy is not only damaging for the record companies that invest tens of million of millions of pounds annually in artists. "The knock-on effect of music piracy can also be hugely damaging to local retailers and the wider music industry that employs 126,000 people in the UK and is worth £5bn to the UK economy."